Exquisite English and American Golden Retriever puppies available a few times a year. AKC registered with outstanding pedigrees with many Champions and International Champion bloodlines as well as Companion Dog Titles and a 2 year warranty; happy, healthy puppies that have been handled and loved from birth. Our breeding program has consistently produced gentle, loving and very friendly puppies with superior intelligence. We love to spoil them for their new adoptive families and it shows. Check with us for more information about these wonderful companions. 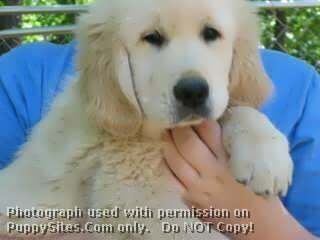 BentcreekGoldens.com – Beautiful AKC registered Golden Retriever puppies with imported International champion bloodlines.